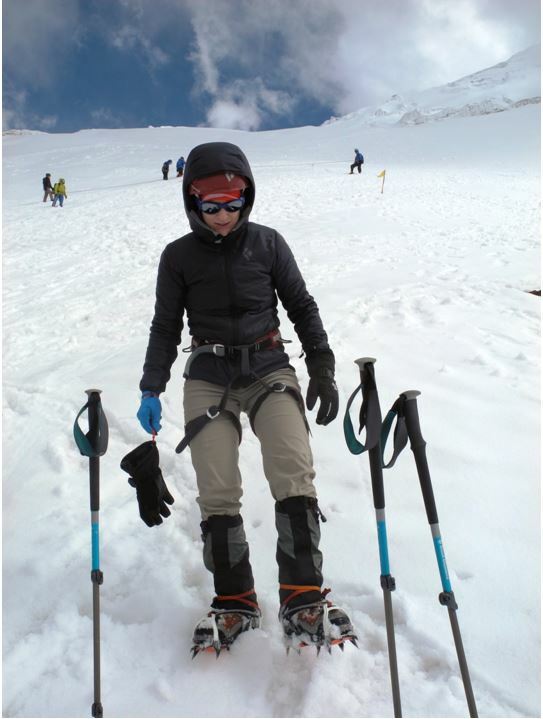 Nicole continues the account, describing the difficult conditions and the all pervasive altitude…. 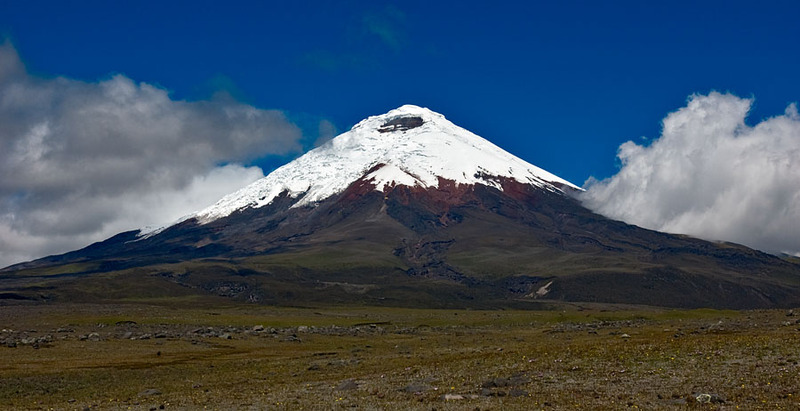 “Cotopaxi is a popular tourist destination with many day visitors hiking up to the José F. Ribas Refuge at an altitude of 4800m (many of them showing signs of AMS). Fortunately a road takes you up to a parking lot at 4600m, this makes for only an hour hike up to the refuge. Only an hour but our very heavy packs and the thin air made it tough. The refuge is a newly renovated double story building, Diego had organised us the smaller dorm room which slept six, and this was our room for the next 2 nights. We had some tea and then sorted out our gear for our first day of glacier training. Crampons, double plastic boots and ice axes were completely foreign to us two South Africans who had never seen a glacier before now. So two days of training were needed prior to us attempting the summit. Diego patiently taught us the different techniques of climbing in crampons, not stabbing oneself in the leg or cutting the rope with the spikes is important to try get right. Equally important is learning how to stop yourself sliding off the glacier should you fall, for this we endlessly practiced the technique of self-arresting with our ice axes. By now our long acclimatisation process was paying off, neither of us had headaches, we were not short of breath, our appetites were reasonable and that night we slept well. Sunday morning we woke up and the first of that nights successful summit parties started returning to the refuge around mid-morning. All of them kept telling us that it is just so hard, the exhaustion on their faces showed it. Another round of glacier training then we had an early dinner before getting into bed at 7pm. Our alarms were set for 23h00 but none of us slept, excitement nerves and a howling wind kept us awake. Midnight is our planned start time, we need to summit and be off the glacier by midmorning, as the sun warms up the glacier the risk of rock falls and avalanches increases. We get out of our warm sleeping bags, finish getting dressed (we sleep in most of our clothes anyway due to the cold) a quick cup of tea and we fill our thermos flasks with boiling water. Stepping out of the refuge the freezing wind takes our breath away; we quickly pull our Buffs up over our mouths and noses. 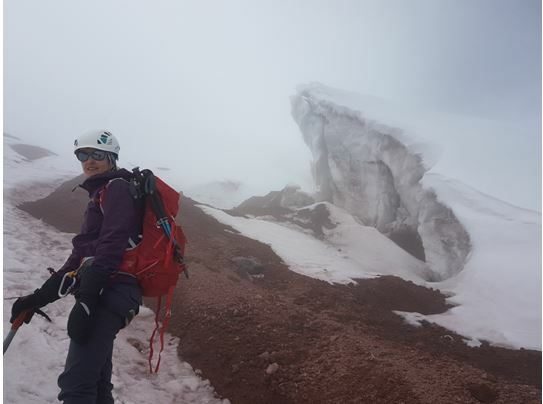 The glaciated ice cap of Cotopaxi used to reach all the way down to the refuge, it now takes us an hour to hike up to the glacier before we need to put on our crampons and take out our ice axes. Global warming has caused the ice cap to recede by 40% in the last 25 years, I find that terrifying. The next six and a half hours are the most brutally difficult thing I have ever done. I thought I was fit and knew what to expect but I was so wrong. The steepness of the glacier, walking up it awkwardly and sideways in crampons, made our legs burn within minutes. The lack of oxygen made us slow, my mantra was “ice axe, step, step, breath”. Our headlamps illuminated a small area in front of us, we concentrated on just putting one foot in front of the other, carefully, don’t slip. Suddenly the ice would just open up next to, or in front of you, when we would come to a crevasse. These deep black holes were intimidating but we knew when must just concentrate and not slip “ice axe, step, step, breathe”. Edging along a narrow ledge, the steepness of slope was terrifying; the ice just disappeared into blackness next to our feet. If one of us slipped we would drag the two others with us, only our ice axes would have a chance of stopping us. It was scary but we were calm, probably because of the lack of oxygen making us a bit mentally slow. Through the years we’ve been very appreciative in the way the “Homes To Grow” project has attracted support through many different sectors and we’re delighted now to introduce two intrepid adventurers, Nicole Morse and her partner Marelise Bardenhorst who are on a quest to scale the high mountains in Ecuador. Their trip is self-funded and they have kindly offered to champion our fundraising efforts in support of the “Homes to Grow” project. Of all the requirements to ensure the children’s needs are covered, the cost of their education is the most pressing. We are aiming to raise R1.25 million through the long term and we have a very long way to go! The funds being raised through Nicole and Marelise’s endeavours are a promising start to this year’s target goal of R300,000 which will cover just the school fees. Their departure is set for February 16 and they will spend their first days in Quito acclimatising to the altitude. The plan is to ease into the experience by hiking trails on the lesser mountains – Pasochoa (4200 m) Pichincha (4696 m), IlinazaNorte (5126 m) and then try to summit Cotopaxi (5,897 m). Prior to this undertaking they will undergo technical training on the glacier to hone ice-climbing techniques using crampons and ice axes. If all goes well they will attempt to reach the summit by starting the climb at midnight on the seventh day. This will give them time to descend before the sun warms the glacier making it unstable by possibly causing avalanches or ice and rock falls. 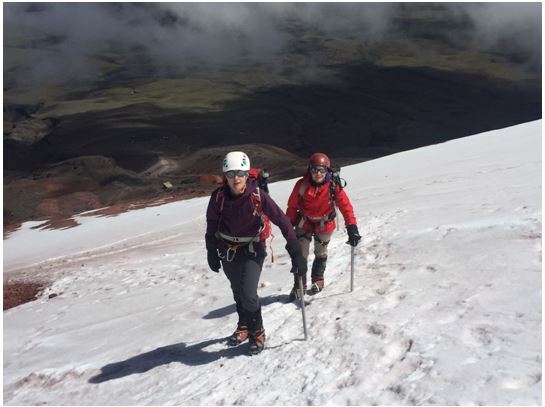 Additional challenges for the climbers could be adverse weather and altitude sickness. Tackling this rugged and austere terrain is not for the feint hearted! A steely determination shows through Nicole’s nonchalance when asked about the motivation for the adventure. She explains that it’s the challenge of wanting to climb big mountains and to experience glaciers that appeals as well as the quest for pushing oneself to the limit. After they have achieved these initial goals and if time permits, they may even consider Mt Chimboraso, which is Ecuador’s highest mountain at an altitude of 6268 m. It has the added allure of being the tallest mountain in the world – that is not by elevation above sea level, but through its location along the equatorial bulge, making it’s summit the farthest point on the Earth’s surface from the Earth’s center. The months of preparation and physical training is paying off. Nicole’s latest dash up Platteklip Gorge (Table Mountain) took an hour and six minutes and a rapid forty-eight minutes to come back down. While Marelise is presently studying in Amsterdam for a PhD in exercise science her training has involved a lot of gym work. Their goals and aspirations are an inspiration to our young children and we’ll be eagerly following their experiences. What a way to learn about the geography of the lofty mountains of the Andes, right there on the equator clad in snow and juxtaposed between glaciers and volcanoes!